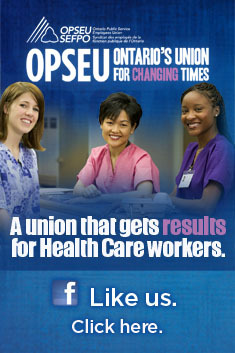 In his first rally following re-election at OPSEU’s Convention, April 8th President Warren (Smokey)Thomas challenged Ontario Hospital Association President Tom Closson to sit down and talk about the hundreds of hospital professionals that get treated as an afterthought by hospitals and the Ontario government. OPSEU’s Hospital Professionals are upset that the OHA offered little at the central bargaining table, resulting in a quick referral to binding arbitration. Sandi Blancher, Chair of the HPD bargaining team, said the hospital professionals are being treated differently that the nurses, who have recalled their mediator in an attempt to reach an agreement. “Somehow I don’t think the Ontario Nurses’ Association is looking at the same kind of offers the OHA thought was good enough for our hospital professionals,” she told the crowd of about 500. Retiring 1st Vice-President Patty Rout contrasted the mandatory full-time targets for nurses to the situation of laboratory technologists, of which more than 50 per cent are part-time. She also spoke of the lack of consistent support by the OHA for pharmacy technicians, who are facing substantial costs in time and money to re-qualify for their jobs. The pharmacy techs must be accredited under the College of Pharmacists by 2015. “They have little support from this government or many of the hospitals they work for through this process,” she said. After rallying outside of Simcoe Park, the group marched around the downtown office tower in which the OHA is headquartered. 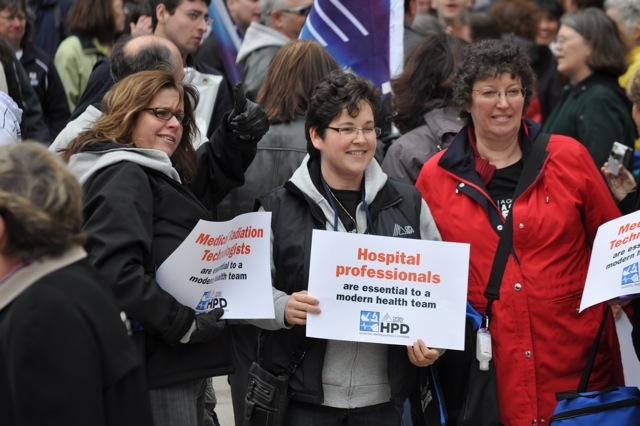 Demonstrators hold cards representing different hospital professions at Friday's rally outside the Ontario Hospital Association offices in downtown Toronto. The rally was great…shame to the OHA! !! !